Hello pie fans, let’s get straight to business. I am aware that in the past I have, on more than one occasion, intimated that this is the end of the road for Meat Filled Pastries only to then be drawn back in with spiels dedicated to that holy trinity of meat, pastry and gravy however this time, this time is different. I mean take a look at this review for example, this game took place in April, it’s July now and this is me just getting round to ticking it off. Something had to give and at the moment it seems to be the pies. That’s not to say I haven’t been at games and continued my adventures to the back of beyond to watch 22 men(or women) kick about a polyester sphere whilst getting my pastry fix, it’s more the aftermath that has suffered. Whether that be an increase demand in work, to learning Spanish, from wanting to see the world and just generally hanging about with my friends and family all have taken precedent over a few hundred words about pie. More relevantly, to those of you who have kept with me during this, I really do want to put this all together into one coherent collection of my journey. From the first foolhardy bet, to the awards and media appearances up until the right here and now where I’m stealing 30 minutes from my lunch to type up this review. I think it’s a good story to tell, but an impossible one to do if I don’t step back, take a breath and look what it’s achieved. So there you have it this is my swansong, not a forever goodbye, more I’ll catch you later. Price: Dropped the ball here. This was somewhere between £1.20 – £1.70 and so if anyone want’s to correct me then please feel free. Given it’s chicken curry nature we can class this as a luxury pie and as such anywhere within the bracket I’ve just quoted is more than acceptable. Presentation: This is a direct copy from my last review. Same place, same presentation. Medium sized white napkin that was bigger than the circumference of the pastry that sat on it. It’s all you need really. Meatiness: Chunks of tender chicken breast awaited my gob replacing the normal crumbly mutton that a scotch pie possesses. Cubed into properly bite size chunks they were coated in a luminous yellow curry sauce that you would often find smattered on the pavement outside Central Station on a Friday night. As I discovered at the most recent edition of the World Scotch Pie Championships chip shop curry sauce is very much a controversial subject. For some it offers the comfort of home, providing that pick me up on a hungover Sunday evening as it’s smothered over a poke of chips. For others it is an atomic bomb to the senses, an overheated day-glow paste that stains everything it touches from your teeth to you trainers. I fall somewhere in the middle, appreciative of the joy it brings others whilst the food wanker lurking within wants something more complex and ‘real’. Stripping it back to what this pie is; a matchday snack. It does an amicable job of satisfying hunger whilst being slightly different from the norm. Pastry: The pastry was interesting and perhaps a consequence of the different filling this pie offered. First thing that struck me was how pale it was, perhaps not subjected to the same boil out and fat that a scotch pie normally has meaning it was almost white in colour. Secondly was it’s texture, almost bread like with a biscuity crunch as opposed to buttery and flaky. With the pie filling it worked quite well although to this day I’m still not sold if it’s something I liked or not. Brown Sauce: Imagine tangy brown sauce on a curry pie, that would be a sensory overload for even the most adventurous of palates. It didn’t happen here. Overall: Nothing flashy here. Chicken that was well cooked and wrapped in a sunny wash of chip shop curry sauce contained within a biscuity base. When looking at all the elements it is perhaps the least luxurious luxury pie you might ever come across. Gravy Factor: Ravy Gravy. Split this bad boy open, and raise it high in the air. It’s 1991 and you’re giving it large with this spicy yellow pastry. So that’s it, no more…well except one more. An encore if you will from the Falkirk Stadium courtesy of the Scottish lassies. I hate goodbyes so just wanted to get that out the way now. So until the final time, go forth and eat pie! 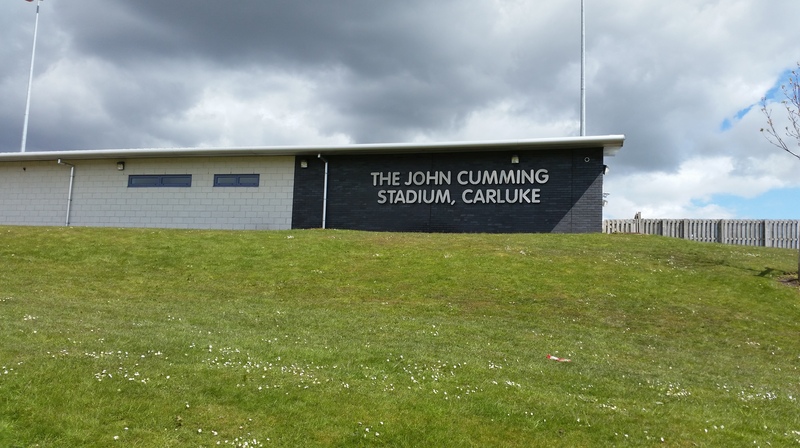 This entry was posted in Football Pies, Junior Pies, Luxury Pies, Non League Pies, Sporting Pies, The Life of Pie and tagged carluke rovers, chicken, curry, fitbaw, Football, Gravy, Juniors, Meat, meatfilledpastries, pastry, Pie, pollok, scottish football, the next step. 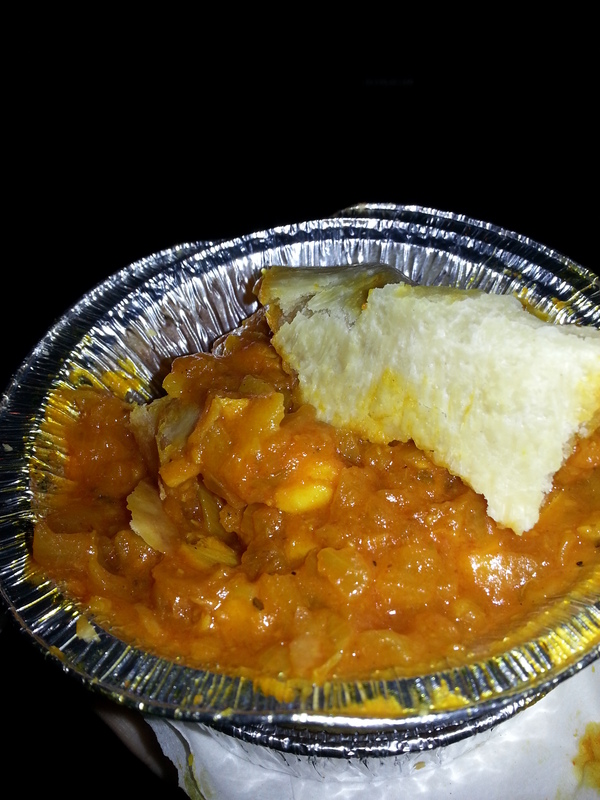 Namaste pie fans and welcome to the latest review from Meat Filled Pastries. This week we get right into the international spirit and take on board one of the more exotic offerings at the home of Scottish Football, Hampden Park. While the staple of Meat Filled Pastries is pies of the scotch and steak variety there is an equal, if not greater, amount of joy found when a pie doesn’t fall underneath these most traditional of fillings. The ‘luxury’ pie is one that must be offered whilst also taking into consideration the taste buds of your average football fan. While a rabbit and crayfish pie sounds delicious, and trust me it is, you wouldn’t really want one at the football. The idea of eating rabbit is still for some associated with Thumper from Bambi, and for that matter the idea of eating a venison pie will for some forever be associated with that same film’s lead character. What is the point of this Disney orientated meander of the mind I hear you ask? Well from my journey so far we have seen The Chicken & Haggis Pie, The Beans, Mince & Tatties Pie and now this Chicken Curry delicacy and I have come to the following conclusion. If you put a full meal into a pie the chances are a football fan will like it, or try it at the very least. Now, there is no facts and figures that I can provide that will prove this theory as accurate. It is more based on the hum of excitement I hear at the football grounds I visit when an interesting new pie is on the menu. So with our appetites suitably whetted with all this talk of luxury pie, let us not waste any more time, let’s rate some pie! Price: £3.00. That’s a new highest priced pie on the Meat Filled Pastries pages. Twice the price of a junior football Steak Pie, a luxury contemporary, and 40p more expensive than any of it’s pastry cased rivals at Hampden. This pie has a lot to live up to. Presentation: The first thing that strikes you about this pie is that is bigger than a standard scotch pie, noticeably so. It comes in a tinfoil case that fits snugly round pie, perhaps too snug as it made it difficult to take that all important first bite as can be seen by the picture above. Also the napkin was one of the smaller plain white variety and as such it became immediately apparent that it was not going to be sufficient for the mess I was about to find myself in. The problems caused by the size of the napkin were highlighted further when the pie was placed in my hand as I spent the walk back to my seat juggling it between my two hands such was the heat coming through. Meatiness: This was a very meaty pie, it was deep filled, really deeply filled and when also taking into consideration the more generous portion of pie you get for your pounds the £3 cost starts to become a little bit more bearable. Then I took a bite, and my mouth was awash with a molten madness I hadn’t encountered in a pie before. Firstly the filling was piping hot, the chicken chunked into small 1cm cubes adding a lovely texture and bite. But if the temperature of the pie itself was hot the taste of the gravy had you in a spicy haze that no Bovril could quench. Let me say here that I love spicy food. I have a collection of hot sauces that have been known to make grown men cry but I don’t think the terraces is the place for something with so much punch. It was heady with spice but with had an almost sweet aftertaste on the back of the throat, something that helped to counter the ever increasing inferno in the mouth building as each bite was taken. This was certainly a meaty, spicy treat but a filling fit for the terraces I’m not sure. Pastry: As previously stated this was a bigger pie than usual and as such had more pastry to encompass the filling. The problem with the bigger pie and the tight fitting nature of it within its tin foil suit of armour was that as soon as you took one bite the lid came off and you were left with a bowl of chicken curry without a spoon to eat it with. I tried the classic ‘pastry as spoon’ technique but as there was no hard upper crust as found in a scotch pie the pastry just flopped under the moisture of the gravy. Instead I had to resort to finger picking my way through it. Not a big problem I hear you say. However once my final scraping of the foil with my turmeric stained fingers was complete I had realised that 22 minutes of the game before me had passed by. A pie should be the side dish to the main meal of football and unfortunately due to the lack of a solid pastry base this wasn’t the case in this instance. Overall: This pie has left me a tad confused. While the £3 cost is expensive it certainly felt more filling and was obviously bigger to the naked eye. I also thought it was very tasty but ultimately unsuitable for watching a game of football from the stands. The napkin was too small and the pastry collapse created a distraction from the game I had paid to see. I think if I was to have this pie again whilst watching the football I’d want to have it from the comfort of my couch. Gravy Factor: Spicy gravy but best leave it at home knowing that you have a wonderfully tasty pastry sitting there to warm you after a cold winter’s day. Another pie down, and another variety added to the list. 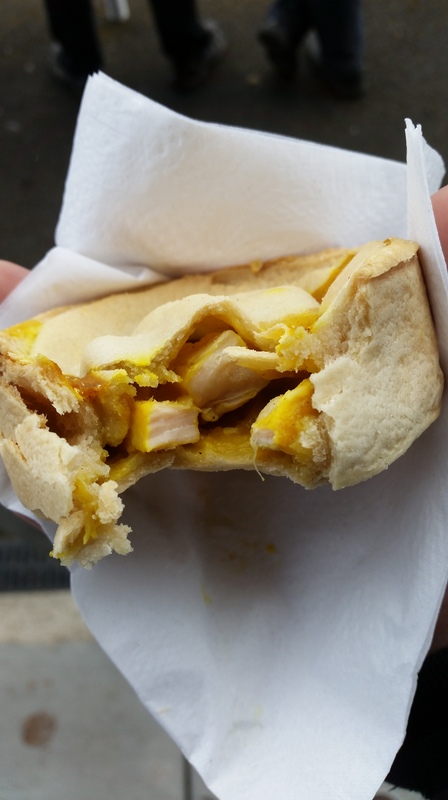 The next time you hear from Meat Filled Pastries will most likely be a review from Lochore Welfare, weather permitting, as we go back on the junior pie trail. Did you know you can Subscribe to Pie? Simply go to www.meatfilledpastries.com and hit the ‘Follow’ link on the right and you will get an email advising of the glorious news that a new pie blog is ready for your consumption and while your at it why not have a look at ‘Leading The Line’ a blog not based solely on Pies, crazy I know! The link is on the left hand side, and remember to visit ‘MeatFilledMerch’ for all your pie fashion needs where any personal profit made will go to The Grambler: Kick Cancer’s Backside Fund’ a truly worthwhile cause. This entry was posted in Football Pies, Luxury Pies, Professional Pies, Sporting Pies, The Life of Pie and tagged chicken, curry, Football, Gravy, Meat, meatfilledpastries, Pie, scotland, soccer, spicy, tartan army, tumeric, us soccer, usa.